Roasted chicken with new potatoes, onions, and garlic. Is there such a thing as too much garlic? Probably. Eventually. That roasted garlic french stuff was too much garlic. If your very polite friend says you smell of garlic then tries to backpedal by saying it might be her husband, that’s too much. Tonight was not too much garlic. In fact, Himself request more garlic next time this stuff is made and he may be right. I need a kitchen camera. Just a cheap one, that it’s ok if grease gets splattered on it. I am cautious with the Nikon D90 W/fancypants lens. O yes, can take great pictures but not in the kitchen with all the stuff everywhere. Thus, no pictures but if you have any kind of imagination…bear with me because this was the kind of meal that made me sigh with satisfaction and wish I had a bigger stomach. Did you know May 4 (my birthday!) is International Respect For Chickens Day? I respect the chicken. I respect it’s dedication at providing eggs and it’s commitment for giving it’s life that we may have fried chicken, roast chicken, chicken broth, chicken pot pie, and King Ranch Casserole. My favorite roast chicken. 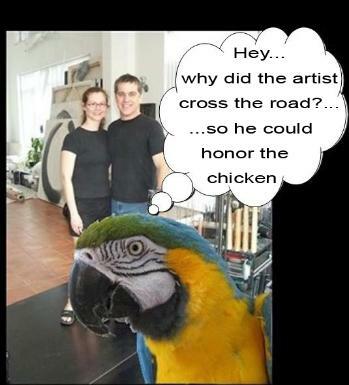 It is how I honor the bird who gave it’s life for me. I want to treat it with respect, not shove it in a can and coat it in mayonnaise. So, I use a bird that has lived a long enough life to get a layer of fat on it. (no wonder my thighs…but really…at my age…whatever). A roasting hen, not a fryer. Also, little new potatoes, the red kind omygoodness so creamy. And Vidalia onions. Not Spanish ones or yellow ones or white ones, but Sweet Vidalias grown right up the road about 15 minutes from here. Sweet enough to eat raw in a salad but also amazing when roasted in chicken juice and fat omygoodnessyespardonwhileiclosemyeyesandsigh. Also garlic. the biggest cloves you can find. I used 6 or 7 cloves and it was suggested that perhaps a whole head might be better because we were all sort of fighting and stabbing each other with forks to get at the roasted-in-chicken-juice garlic. I caught Himself picking through the bowl of potatoes hunting for garlic. Easy peasy but this is the first time I’ve done it this way and I tell you what, it’s happening again because….chicken juices and fat and potatoes and onion and garlic are quite possibly the second most delicious thing ever (right after that little fatty tail on a ribeye that’s been cooked to medium rare perfection on a hardwood charcoal grill). And SO easy! Set a rack over the veggies. Put the chicken on the rack, coat it in olive oil,and salt and pepper it. Stuff the oregano up inside the body cavity. Roast at 425 degrees for about 20 minutes per pound of chicken. When the chicken is done (crispy and golden and the leg is loose when you mess with it) set it aside to sit for 10 minutes or so. Then cut into pieces. Put the vegs in a bowl and pour the pan juices all over them. Keep a wooden spoon handy for whacking hands of anyone who tries to pick out the garlic, or eat the really crusty potatoes first. Also whack the hands of anyone picking the skin off the chicken because that’s COOK’S PRIVILEGE. The Son Who Ate With Us opined that the potatoes would be excellent as hash alongside an omelet. Next time I’ll have to make more because there was only enough left for Himself to have for lunch tomorrow. However, I am not sure that there will ever be enough of those potatoes. Put all the dressing ingredients in a blender and whizz up. Pour the dressing over the onions and let sit for an hour or so. Right before serving, mix in the tomatoes and olives. This would also be good with some feta cheese thrown in, or maybe those little bitty pearl mozzerella balls. Maybe for Mother’s Day I’ll get a small kitchen camera that I won’t worry about getting greasy or floury. Also…someone needs to invent smell-o-vision. srsly.